Today, award-winning author and cute things serial killer the brains behind Oranges Are Not the Only Fruit caused a Twitter storm by going all Fatal Attraction on us and tweeting a pretty gratuitous shot of a skinned rabbit she was about to cook. Well, if we’re being pedantic here it was kinda half in and half out of it’s skin, which made it all even more creepy, vom-inducing and Hannibal Lecter-y. You can see the now infamous tweet here. Of course many of us already eat meat, so we can’t complain about the fact she found a fluffy bunny in her garden and killed it to eat. But Winterson didn’t really help her case when she started tweeting particularly gruesome crafting tips about turning its head into a glove puppet, as well as gory photos of her cat munching on bunny innards. In honour of the cute and cuddly bunny rabbit, we’ve collected together our top ten favourite rabbits who wouldn’t have taken any of Winterson’s bunny-boiling sh*t.
Let us know which your favourite rabbit of all time is in the comments below. None of King Arthur's knights took this feisty bunny seriously when they'd been expecting a beast with "nasty, big, pointy teeth!". 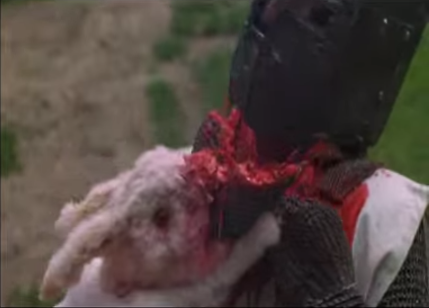 But how wrong they were when the Rabbit of Caerbannog managed to decapitate Terry Gilliam. Monty Python at its best. Need £100? Hidden Cash is coming to London this weekend!